Maguro House is now serving Beer Wine & Sake. Maguro House restaurant has a multi-faceted menu and offers many types of food such as sashimi, tempura, nigiri and much more. Due to the informal atmosphere, instead of ordering and eating individual platters, customers usually share all dishes with one another in their party. 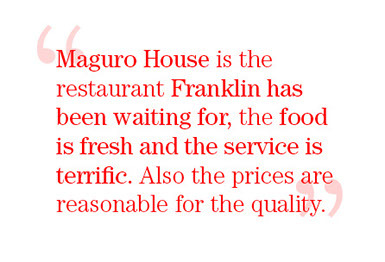 The ability to share food among your party is what makes the Maguro House experience truly unique. Please always inform your server of any food allergies you may have. It is the first step in letting us take great care of you!